I had just typed sometime back that the past week was super yucky, frustrating and nutted up. First my net conn at home doesnt work. The people at BSNL say technical problem. In the middle of work. And then I am unable to send the files. My writer stops at 58% and refuses to do more burning. And smoke came out of my ears. Couldnt send the files in time. Floppies didnt work. They must be using defective pieces now, since floppies dont sell all that much. And then I had to go do all the translation all over again. boo hoo... Too much driving. Yasaswini goes back monday. Dunno when I will get to see her next. In between some nice things happened. Like last sunday, attended a Podcasting meet organise by none other than Kiruba. Spent some time there, decided I will put up some audio and video blogs soon. It will be better off for mom also to explain some stuff if its supported by audio. Then caught two movies on two consecutive nights. Batman Begins and Chandramukhi. Sathyam Cinemas. And since it was Chandramukhi and since it was night show, some people seemed to more interested with what I was doing and with whom I was than watch the movie itself. And I had gone with mom and a friend. YUCKY. Hate my life sometimes. Cant do your own thing. No privacy and on the other hand mom worrying to bits about a lot of things. Gossip for one. And this explains what? I can forget about usual life people have. Can't be seen with the same set of people especially if it has the same set of boys.. cant jump into the water and have a swim and not worry, cant just drive the way I want, eat the way I want, do things the way I want. Because the soceity is watching. The people are watching. And I am a girl. Why wasn't I a boy? Damn. And cant even have a normal fight with my mother. People are hearing people are watching. I cant forget about the usual gen gaps we are all said to have. And when mom does tell me that I dont practise enough and if she sounds louder, then people have to go tsk tsk.. hellllooooo its our life... why do we need to be judged by some peeping toms and hearing harrys? why do we have to live in constant fear of what will be written and said about us? And its becasue mom grilled me that I am who I am today. A diamond needs to be cut.. for the brilliance to emerge. And that doesnt happen without effort...! And NOPE. The mediocrity wont understand that. The damn soceity wont understand. Why because we are two women. It would have been good if I had been a son. I cant see guy friends outside home. I cant see them at home. Outside, then gossip, people will see. At home, then people will say too many boys coming home. They can forget we have been together at school, or at college or at work. Or the guy home can be someone who is working on my damn system which conks every three days. But no. Its a guy. Finito. Then watchmen will gab, servants will yap. Yeeearghh. Airtel sends me a bill for some other phone number. My mom's name, our address but some other number. Disconnects my free sms facility without informing. Says due date to pay bill is 26th but decided to disconnect on 21st. One of numbers had been asked to be name transferred, with all documents provided, three months back. STILL not done..Does not give 200 mins of free local, 100 mins of STD free. Please someone help with Airtel, or I will get a nervous breakdown and mom says she will get a heart attack. Would it be a good idea to sue? On the grounds of mental trauma, cost of petrol and shoddy work to say the least? And CHECK out the fuel prices! Am gonna get myself a hand cart. Or a cycle rickshaw with a driver, ahem, cycler. Had to go judge a school competition today at Vidya Mandir, Adyar. Hot and dustry as there was a make shift stage and Pandal on the school grounds. sigh.. anyway that was done. That school is goddamn lucky to have the english teacher I learnt from. 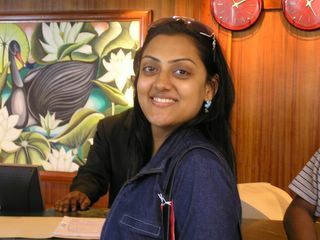 Mrs. Uma Prabhakar. She is a pretty small made lady, always wears crisp cottons, and scrispier in speech. Her classes used to be crackling with excitement. And she always had a way of nurturing the creativity in each child. My 9th and 10th Standards were with her. And That is an impressionable age. I owe a lot of my English language development to her. Sometimes if all of us were too loud, and if she was in the next classroom, all that she did was to just stand outside our class, and give us all a plain look. And then she will say something in the softest of voices, but clear enough for all of us to shut our traps and be quiet, while there were times when even rapping a wooden scale on benches or boards could not shut us all up. Life in school was good. It was carefree. Happier. Then we all grow. Grow up to be what? The Italian concert. Thanks a lot for the link. Some songs are not there, surprisingly. My Bhajan is also missing. Sigh again. If I remember right, there were 18 or 19 items. The past one week has been sooper frustrating.. for starters, My net connection conks. had a deadline to meet. My writer conked. So couldnt send the documents I worked on after copying.. The floppies I used must have emerged from a garbage dump and landed right into some manufacturing unit. I try and copy files, it goes to another comp and refuses to open my files. So there I went translating all the documents all over again..
Too much driving also. From one end to the other. Yasaswini leaves on monday. Haven't been able to do soo much of work.. In between some good things happened too.. I finally got to catch two movies at the Theatre. Whats the Apple Powerbook? And how good is it? Dan Brown’s collection. Mills and Boon crap, Emotinal Intelligence, Remembering Past lives, I ching, A Bend in the Road (Michael Sparks)... some more I forgot. Dan Brown, Autobiography of a Yogi, Swami Rama, Search in Secret Egypt. NO CLUE.. haven't read even one of his works.. pleeease dont hate me! No clue again.. do I hear some sighs?? HAve read half.. really like it.. no unwanted show of the language.. simple, touches you. And conveys the message. oh god I dunno abt this Tag now..
for starters I used the Acrobat and an OCR.. when I right-click after ctrl a, it shows me to select text with OCR. So the biggest prob in my life is solved.. but guess this has a trial period too.. but until so far away, it will be so good.! Is there a way to change text, which is a picture object in Microsoft Word to text so that I can edit? I am so fed up of typing out the whole original text and then editing.. I guess it was copied form a PDF and then pasted to MW. Jimmy --> rest of the vowels are added too at times.. along with a 'z' jimzoo.. jimzeee..
Well I guess thats all..
My head. Can be better.. the stuff thats in it.. But I like it.. generally! Someone coming up and booing behind me when I least expect. I give a start. Do work that at least 5 generations after me remember me. Have been frightfully busy.. Have started work on a new Linguistic assignment and it has been taking all my time. Pressure. But I love it. I even typed out a blog which is still saved as a draft.. Hope I shall be able to edit and post that soon. The people from my dance class planned and went to crocodile bank, which is almost about 80 kms from chennai and went further ahead Mudaliyarkuppam Boat house. Awsome. We had to ride in a motorboat so almost got drenched in the spray. There is a small private beach resembling an oasis on an island. We had a good day. Took my handycam.. There was another private beach at the croc bank. The whole group freaked out there swimming and all were in the water... (everyone except for me and two others), got drenched from head to toe.. I love the feeling of bathing in the sea but its the stickiness thereafter. ewwwww..! And also it would be good if there is a transport from the shore to the solid ground so that I dont have to get the sticky feet with sand feeling.. I hate it !!! The crocodiles.. they looked like they were dead and like their skin could do with some super strong moisturiser. They dont move, they dont blink, and they have transparent eyelids.. what more could you expect? Only when some move, trampling on the other thick skins to go and idle and go into 'statue' mode again, then you realise that there is something ticking in them. And that thay also live.. there was also a snake park, which I didn't really bother checking out. Andrea had a small dance session with the local village children and they had great fun. She was trying very hard to speak tamil. Yes, she has lived in Chennai all her life but can't speak all that well yet. Also happened to catch a puppet show there. Something put together by the same village children. And the people who work at crocodile bank live there ... there aren't any shops for miles, but their children go to schools almost 70 kms into the city everyday.. and they are one with nature.. was amazed to see very young girls make agile climbs half way up trees. Mom had great fun too.. Aditi also happened to come but she was soo engrossed in Angels and Demons that even if the sea had roared she would be like "Anti matter, Vittoria, Cern, Langdon.." I shouldnt have taken the book in the first place! There's something about the sea... when the waves crawl on to the beach, sometimes dash and sometimes rush, and sometimes just laze in, its like I want to learn something from it.. No matter what the waves keep coming.. perseverence maybe be? Yeah its all the rotation and revolution and the earth and the axis... all that is fine.. but I sometimes imagine a pristine blue sky, clear blue waters, and no one around for miles... and somewhere in the distance in the line of vision to your sides you see the land and water converge and become one.. and then some mist.. that would be wonderful.. and fishes playing hide and seek.. you just feel that there is something else which makes the earth turn around ... at that moment.. you are one with the world.. and you think all is love... there is no difference between you and the other beins.. like the rhythm within and the rhythm without, the music within and the music without are all part of a cosmic symphony and there is nothing but you.. and then that you are nothing. Feel as light as a feather, feel everything around you dissolve and float , float above to higher realms, to where there is only white... and the white, that is love.. you breathe, see, live love.. And you feel you are embraced, tenderly, held, encompassed ..... and then your finger is softly encircled by a hand which leads you, guides you. And you are safe. Protected. Nothing to worry. No cares. No burdens. No luggage. And that sensation brings you back to the many hands that encircled your finger when you faltered. Your mother, your father, your grandparents, your friend, your partner. And maybe, you think God works his love through people.. and maybe, are the people God? And when your hand reaches out to wrap another finger or a hand, the love that is in you flows out, the God in you flows through, the goodness flows through, and connects. And when that happens maybe, I think, we are all part of one..So many zillion parts of One. Surf's up and my site's up too.. :) Had to upload the whole gamut of files and pics again..
And I see that I have something for green though its not really my favourite colour.. I ended up having the same shades, more or less for both my blogspot and the site.. and hadn't planned it though. I am off to All India Radio. 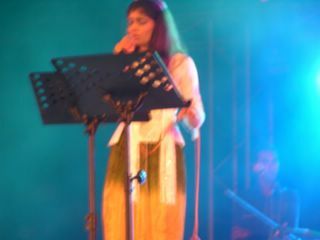 I was given the B grade in 2000 for winning the All India First in Ghazals and I received the award in Jammu. And after that, to qualify for a higher grade you should have given at least 5 concerts until it expires in 2005. I have given one.. Why? I heard its the anti-hindustani music campaign thats happening in the circles here? More and more youngsters are cuddling up to Hindustani Classical and people are, not surprisingly, worried about what will happen if it is populrised on local radio also. Tsk Tsk. Mom said we will go there and check out. I watched Bunty aur Babli yesterday. Damn cute I thought. Yeah, its not like intelligent movie and all but I loved Senior and Junior AB. And more Rani. She has come a long way as an artiste.. Nice clothes. More than super locations and the music made me wanna get up and dance. Candyfloss. And nice comedy. I didn't really understand the movies that he acted in, not that I have caught that many. His movies had some great songs like Aane Vaala Kal from Golmaal. 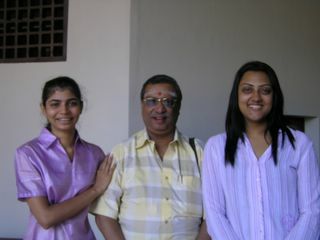 He also came up with a Marathi movie called Anaahat. Which didn't have the usual commercial ingredients, but had an amazing 60+ weeks run. Wish I can get the DVD. From the trailers I saw, thats another movie I'd like to see. And Mr. and Mrs. Smith. And Mangal Pandey yaaaaaaaayyyy.... I saw the trailor yesterday. Super the music sounds..Ethereal... I am almost jumping around in joy. Rahman Anna's music. And no one will believe Aamir Khan is 40. They maintain their body well. The weekend.. doesnt make much difference to me... weekdays weekends.. all the same. Except that I have dance class which is why I have begun to love weekends more, and maybe catch friends who are on the 9 to eternity grind, otherwise I generally dont like weekends. This weekend was special becos I got my braces removed and flashed my 32 to almost everyone making them wonder what got to me.. and then they went 'ohh thats why you have been smiling so much" My mouth feels empty. Post coffee and yap-yap we went to this play, EVAM INDRAJIT- Your life in three acts. Put together by Evam and Madras Players. A play about youngsters, and how they dare to dream, and then sometimes dunno what they want to do in life, but just keep going anyway. College, degrees, jobs, girlfriend, marriage, children, house, better jb, better salary, children's education.. Basically this play said that its all a circle.. we are on a track, where no train comes. If you look ahead, the tracks meet somewhere at a distance. If you look behind the tracks meet somewhere in the distance. Whats in the past is in the future.. there is no hope.. Some of the lines which were said in the play. Which went above my head.. I guess there was some opimistic part which I missed. I just kept searching for something.... and I didnt get it. There was some humour which raised it head brightly in between.. but even then I lost it..
Talking about EVAM they are one of the most popular theatre groups in the city. ANd looks like they are going to hit the national arena soon, what with EVAM INDRAJIT playing with Prithvi. I have liked their comedies. We were informed that they were coming up with a new comedy on the 15th August. Looking forward to that. On a hypothesis, if I had had a life of struggle so far. Thats my past, I look forward to something, which is also struggle? So was feeling desolate and dismal the rest of the night and till today. And the guy also falls in love with his first cousin, Manasi but they dont marry, for whatever reason, and then he marries. When asked by a long lost friend, Did you marry Manasi? No I didn't. I married another. 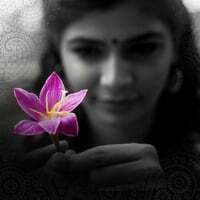 There are hundred's of Manasi-s. Maan.. imagine that..
Fall in love with someone. And then that doesn't happen. Then someone else. And someone else?? Too much for me to bear.. Or to think of.. What happened to this whole concept of give and take and everyone wants to be on the receiving side and none on the giving? How will you receive happily if you dont know how joyous it is to give? Why is it that the grass is always greener on the other side? If it is, then why dont you try and grow some greener green grass on yours? Lot of questions.. sometimes I like being alone.. listen to whatever is around me.. look at nothing in particular.. and watch my thoughts scream by, shout by, and talk by, ...softly by .. I am still to reach that stage where they will whisper and then finally they stop happening.. thats supposed to be a high altitude to reach in your personal evolution. Thoughtless .. literally. On that thoughtful note, we happened to go to a mexican restaurant with Aditi, her mom, my mom, and two friends.. Don Pepe. Food was decent. I will have to write in, in a couple of days and send it across to my boss. Replying to some things. . 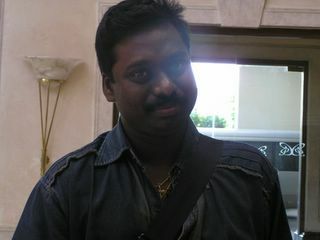 I will put in the blog about the KMI experience and about 'Enn Uyir Thozhiye'. I was asked about the raga bit which I sing in between and in general about how I felt about KMI. And replying to another Q, Noothana is based on Nalinakanthi except when a Dha is introduced in the last line of the charanam. Until then its strictly adhered to, mom said. I am gonna check out a few movies in the theatre with Yasaswini. Tomorrow and the day after maybe. Dance class today.. Finally they have separated the beginners and the advanced students. Good for both the groups..
Haven't watched a movie in a while.. must catch.. problem most of the times is the company.. I wish there was an easier way out. Am working on a lot more changes on the look and feel of the blog page. Have been checking out some designs, or might work on a new one... Once upon a time I had learnt all the stuff.. HTML, VB, Java, SQL Server,wotnot.. Everything is in the disintegrated mode! Remember almost nothing. Forgot to close a tag... and was wondering what went wrong. Totally in duh! mode. BTW finished Angels and Demons on the train.. too cool.. really loved the antimatter stuff... That guy sure makes a lot of sense.... Lowe him :) Also read Edgar Cayce's book on Remembering Past Lives.. Readable. Guys, finally the analysis on Amudhe Thamizhe. Scroll Down. As I said all this Raga and theory is too much for me, but thanks to this I learnt something new.. Keep asking, and that way I can learn a lot more from my mom, and in the process, know a lot more about Raja Sir too !! Film music belongs to the popular music genre. I have been into the field of Indian Music and musicology with a fairly long and deep study. Every time I am in a studio with a director, small or big, new or experienced, I get a deep sense of gratification in terms of learning. I understand what all I missed in my pursuit elsewhere. Always claiming that they are not competent with the classical genre, almost all of the music directors have a grip over ragas much deeper and wider than most of the initiated. The compulsion of having have to create a new tune every time with a new song, keeps them continuously exploring as all music is restricted to move within the 12 note gamut. And popular music gives them an immense possibility due to non restriction by grammatical means of a raga. Their brain is globalized. They are formally educated on the chord system. Their rhythm is perfect as they go by the western beat. Absolute time measure. Their pitching is based on the keyboard supported by the music software to perfect them. Many of them are very well conversant with the orchestral music. What else do you need to score one up above the pure classical musicians in terms of creation and reach to the audience? Talking about Shri Ilayaraja, he has a profundity in multiple dimensions. He is a true scholar who has taken pains to perfect all genre of music. Few are they who have a combination of hard work and impeccable accumulation of knowledge. A rare gem who also was rewarded amply in due time for his excellence. A scale (or a murchana ) is a cluster of notes. When they are aligned in an organized ascent and descent, an aroha and avaroha are born respectively. A mere aroha and avaroha cannot make a raga. The definition of the pitch position of each note (dha2 can happen in various colours according to the raga. Just the utterance of a note can indicate the raga. Such should be the expertise), the range of each note the type of ornamentation employed on a note, the speed in which the note occurs or the sequential changes that takes place (for example Ga in Todi) within the raga etc. contribute to the transition of a mere aroh avroh into a beautiful raga. Coming to the raga identification aspect of film songs, I have my own humble opinion. I believe in enjoying the song and its music as it is without dissecting it and trying to have a futile attempt of assigning a raga, which runs on a strict grammatical periphery. I have seen the employment of one particular scale while having a pronounced chaya of a closely allied raga. And believe me I felt, to hell with the grammar! Notes of one raga and the colour of another. Raja Sir’s compositions need one full time thesis. He has taken several challenges and proved his mettle. He broke the unspoken law of superior music or learning as belonging to a privileged few. While catering to the common mass he could serve it on the most intellectual platter. Now at last to this song ‘Amude Tamizhe’. Some of you were wondering whether it is valachi (Valaji actually). Well Valaji employs SGPDNS & SNDPGS. This raga is a janya of Harikambodi the 28th mela grouped under Bana Chakra. The Song Amude Tamizhe is composed without any doubt or ambiguity offering tremendous scope for analysis. The scale could be like this SRGPDS & SDPGRS. It uses Shadhja, Suddha Ri, Antara Ga, Pa and predominantly trisrutika dha and occasionally chatusrutika dha which actually should belong to the scale. Rasika Ranjani comes close to this but the scale has only Pa Sa in aroha. Such an occurrence happens in this song also, but it goes Pa-Dha-Sa several times. Therefore its not Rasika Ranjani. I have not heard or learnt a raga like this. I had to refer a few books which have glossary of scales. Mr. M.N.Dandapani and Mrs. D. Pattammal was a darling couple doing a lot of quiet work. 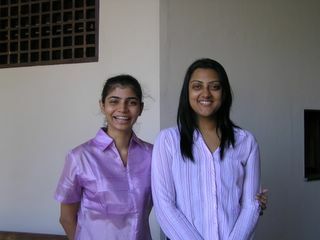 ‘Ragapravaham’ is a work by them and an immensely commendable one. I base my observation on Ragapravaham. This scale comes under Suryakantam the 17th Mela in the third chakra, Agni. The name of the raga is listed as Varnarupini. The use of ri and ga have been done with supreme clarity. In the case of dha, I would like to explain a particular rule pertaining to application. The chatusrutika dha, if followed by Kaisiki Ni, then it normally gets flattened slightly and in my group for our convenience we used to call it as trisrutika dha. If Dha 2 is followed by Kakali Ni, then the Dha is invariably sharp. (According to the Mela, dha is proceeded by Kakali Ni or Ni2.) Now I have already said that the composition uses a predominant Trisrutika Dha which normally adds lilt as a character. In the first part he used this note. The second half uses a definite Chatusrutika Dha which gives a whole new colour to the composition. The song starts like this SRGA SRGA SRGPGRSA SRSDSA for Amude Tamizhe Azhagiya Mozhiye Enaduyire. Then comes the establishment of his deep knowledge in the classical karnatak music. 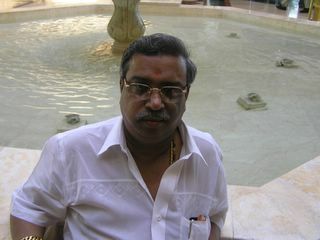 SRSRGPRGPA for Sugam Pala Tarum Tamizh Pa.
By completing the Pallavi he also has established the aroh and avroh. Now the BGM. This gives a new vista to the scope of this scale in its concluding phrases. At the end it goes like this: DASP DASP DSGA and this da-sa-ga makes a jump to a newer dimension – a sea change. While adhering to the classification of the notes perfectly, he changes the tonal colour of the notes deliberately. This type of a deliberate deviation is called bhashanga in the classical parlance. But that one happens on the change of a note itself. This genius of a man changes just the tonal colour by minute shruti variation and brings about a gigantic change in the contour of the composition. Now the second section of the song uses the sharper dha clealy. When deviations are sought out of aesthetic impulses or compulsions the original law is resorted to at least once. The sharper dha application in this composition makes one wonder, is this how the greats worked out the process of crystallizing the raga contour? The second BGM is a treat with regard to the Nagaswaram parts. 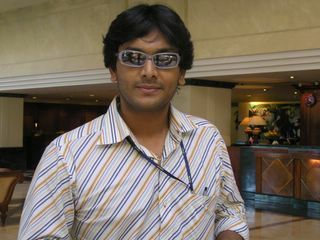 BTW, Amuthe Thamizhe is from which movie? Singers? Scroll Down! And then Scroll up.. I wanna change the order.. But too lazy to remove and post everything again..! 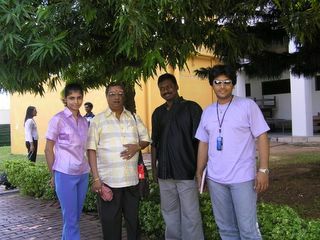 Taken the morning after the show, Groggy.. and usually look like that after removing the goo off the face.. With Abarna Sudhan, RJ Shakthi FM. 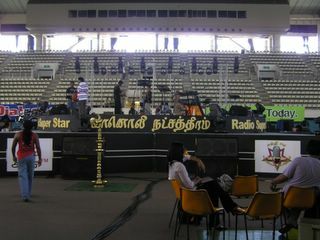 Front View of the Stage - Sugadadaasa Indoor Stadium. Same place.. I think we were cracking up to something that Harish said. And must mention.. Manicka Vinayagam uncle can make me laugh almost all the time, that my mother is usually worried what will happen to my voice. You see, crying is very bad for the voice.. Laughing is worse. Can disturb the voice for sometime. Very sleepy looking.. I was .. and guess Mathangi was tired too.. Rear Entrance - Sugadadaasa Indoor Stadium. 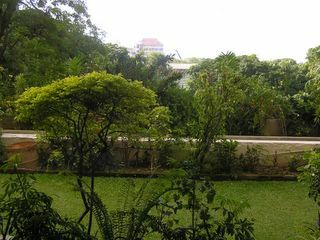 This picture was taken somewhere near the back entrance of the Sugadadaasa Indoor Stadium. On the morning of the show.